Gubernatorial candidates Andrew Gillum (left) and Ron DeSantis (right) vote on Election Day with their families. The men who are vying to be Florida's next governor cast votes for themselves Tuesday morning, with Republican Ron DeSantis near Jacksonville and Democrat Andrew Gillum in Tallahassee. DeSantis, who represented a northwest Florida district in Congress before resigning his seat to focus on his gubernatorial campaign, went to the polls in Ponte Vedra Beach with his wife Casey early Tuesday morning. A small crowd of supporters chanted: “We want Ron!” He shook hands and thanked supporters before he and his wife, holding their children Madison and Mason, went into the polling place. DeSantis, who rallied with ally President Donald Trump both in Fort Myers and Pensacola in the last week, said GOP leaders have tried to convince voters that supporting them will be good for the economy. 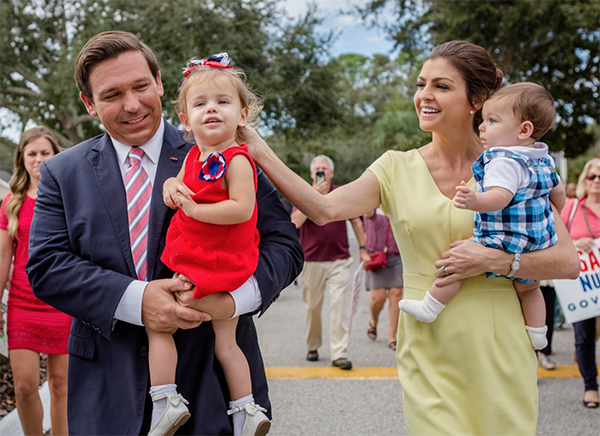 Ron DeSantis went to vote with his wife and two children. "If you start doing tax increases and drive business away and kill jobs and stop the investment coming into Florida, ... it's really shooting yourselves in the foot," DeSantis said. DeSantis' opponent, Gillum, has suggested raising corporate taxes for some businesses in order to fund a $1 billion infusion in public schools. "If you want to protect Florida's future, this is your chance to do it," DeSantis said, encouraging people to vote. "I'll build off the success. I'll be able to get a lot of things done." DeSantis is heading to Orlando for his election night watch party at the Rosen Centre Executive Ballroom. Meanwhile, Gillum voted around 10 a.m. on Tuesday with his wife and three small children at Good Shepherd Catholic Church in Tallahassee. "I'm extremely excited to have just — I guess I can reveal — cast a vote for myself," said Gillum, who is mayor of Tallahassee, as the small crowd of supporters, gathered behind him cheered. His wife, R. Jai Gillum, who voted with him, added: "I did, too." 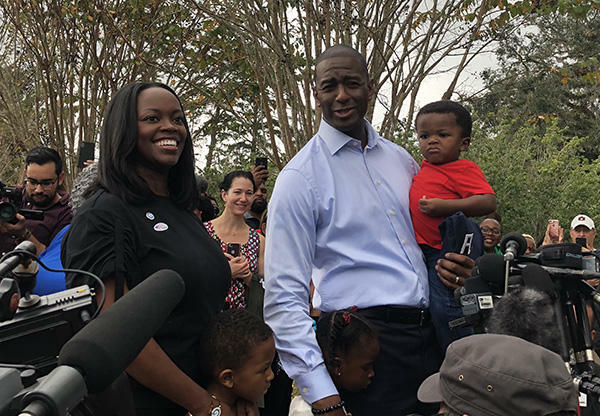 Andrew Gillum went to vote with his wife Jai and three children. Gillum joked about peeking at his wife's ballot. "I tried to look over and see what she was doing, but —," he said, and she interrupted to clarify: "I voted for you." "Okay, alright, my wife also voted for me," he said, laughing. Gillum held his youngest son, Davis, in his left arm, as he took questions from a couple dozen reporters. His other kids — twins Jackson and Caroline — stood at their parents' feet. "Us winning tonight, I think, will send a message to Mr. Trump and Mr. DeSantis, as well, that the politics of hatred and of division, of separation, that they've come to an end," Gillum said. "At least in this election, that's what we're going to show: That people are going out, and they're voting for something and not against. And by voting for something, we're returning to the politics of decency and what's right and what's common between all of us. "We'll worry about history later, but today, we're working to win," he said. Gillum would be the state's first black governor. Race has been at the forefront of the heated gubernatorial race, with the Democrat accusing DeSantis of making racist statements and refusing to denounce white supremacist supporters. Both sides have accused the other of distracting from the issues. Gillum voted just hours after winding down a celebratory rally and concert on campus at his alma mater, Florida A&M University, which is the state's only public historically black college. With headliners P. Diddy and DJ Khaled, and an energizing opening from the school's famous marching bad, the event drew thousands of people, mostly students. Gillum will be back on campus at Florida A&M later Tuesday for his election night watch party. His running mate, Orlando businessman Chris King, will join him there. WJCT and the Associated Press contributed to this report. Activist Emma González, who became famous after giving an impassioned speech in Fort Lauderdale days after the shooting at her Parkland high school in February, stood on the steps of Florida's old state Capitol building on Monday and urged people to vote. "Gun violence is on the ballot," González said. "Our lives are in the hands of the people that we elect. Vote in every election like it's your last, because it very well could be." With only three days before Election Day, former president Barack Obama stumped for Florida Democrats in Miami on Friday with a message that voting blue could help create unity across the state. It has all led to this. Three days before Election Day, Ron DeSantis joined the man who has played a larger role than any other person or issue in skyrocketing his career from Freedom Caucus congressman to the candidate Republicans nominated to lead the state of Florida. The two men on stage Saturday night took wildly different paths to arrive at this moment — one a businessman-reality star and the other an Ivy League military man — but in their rally speeches to a crowd of around 5,000 people, they made it clear their political fates were intertwined.